There are over one million cases of food poisoning a year in the UK1 and it is commonly assumed that most incidents arise from eating out at restaurants. 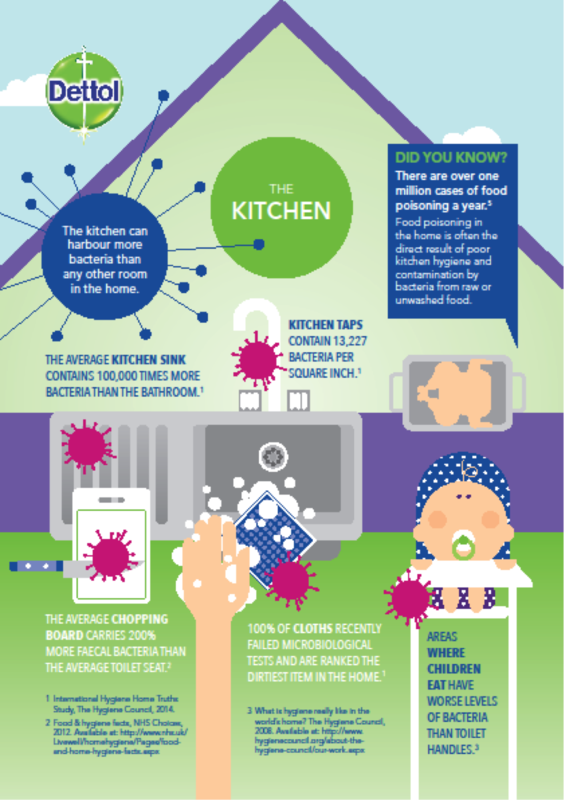 However, you are just as likely to pick up food poisoning in your own home2 and with research finding that the average chopping board carries 200% more faecal bacteria than the average toilet seat3, it is no real surprise that our kitchens are hotspots for foodborne illnesses. As well as chopping boards, the dishcloth is another item in our kitchen that can spread harmful germs. With just 40% of Brits correctly recognising that dishcloths can harbour high levels of bacteria, research has identified that nine out of ten UK dishcloths are ‘heavily contaminated’ with bacteria and six out of ten contain harmful E. coli4. Home Hygiene Expert Dr Lisa Ackerley comments “In our home-hygiene studies we have found that the cloth is often the dirtiest item in the home. We have found billions of bacteria on cloths, including those which could cause illness, and those that indicate faecal contamination. So using a kitchen cloth could mean that, instead of cleaning, you are just spreading bacteria”. Follow these six helpful hygiene habits to reduce the spread of bacteria and the risk of picking up food poisoning in your kitchen. Hands – 11% of our hands are so “grossly contaminated” that they are carrying as many germs as a dirty toilet bowl5. Wash your hands thoroughly before and after handling food using an anti-bacterial hand wash. Surfaces – Almost half of frequently touched items and surfaces could be contaminated with potentially harmful bacteria4. Safe to use where food is prepared, apply Dettol Anti-bacterial Surface Cleanser Spray to kill 99.9% of bacteria & viruses on all kitchen areas, including taps, worktops and the fridge. Sinks – Research has found that the average kitchen sink contains 100,000 times more bacteria than the bathroom3, so frequently apply a liquid disinfectant and leave overnight. Dishcloths –85% of Brits fail to regularly clean their dishcloths at temperatures high enough to kill germs4. Consider using disposable anti-bacterial wipes to hygienically clean surfaces. The Fridge –This is an area that may be in need of a thorough clean, with 46% of Brits only cleaning once a month or less6. To prevent cross-contamination in your fridge, avoid placing meats on the top shelf and separate from other products in the fridge. Chopping boards – “Although ideally it is good practice to have separate boards for raw and ready-to-eat foods, in a busy household this may not be manageable” explains Dr Lisa Ackerley. “Therefore, make sure that any board used for raw meat, poultry, fish or vegetables is immediately cleaned and disinfected using an anti-bacterial product after use”. 4 International Hygiene Home Truths Study, The Hygiene Council, 2014. Disclosure: This is a guest post, all words and pictures were provided for this article. This entry was posted in Guest Post, My Stuff.